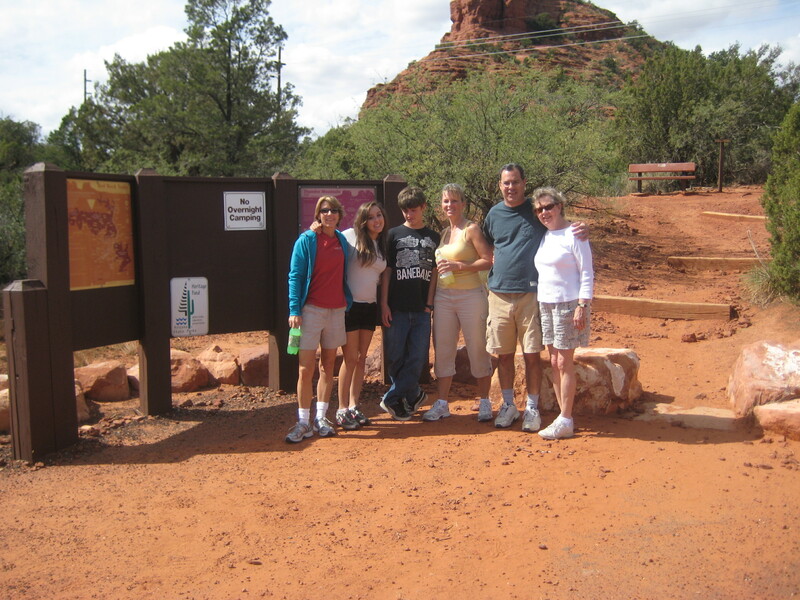 Susan Dawson-Cook enjoying a hike in Sedona with her son, daughter, brother, sister-in-law and mother. Far too often, excessive weekend hours are spend reclining or seated in front of the TV or computer. We plop down in front of the TV on Friday night to watch a Blueray movie on the high-definition box. We barely move a muscle except to reach for another hand of popcorn or push a button on the remote. And then its off to bed. Come Saturday morning, instead of gearing up for a family walk or bike ride, there is email and Facebook to be checked and video games to be played so the former high score can be topped. Is it any wonder that our clothes are getting tighter, our pants are getting shorter (butts are getting bigger), and our children weigh more than we ever did as youth? The truth is, our propensity for the latest technology is leaving us less fit and far fatter than we want to acknowledge. We tell ourselves its all for the better, yet the astounding number of overweight and diabetes afflicted youth screams otherwise. How can you surge against the tide and redefine what is typical for YOUR family? 1 – Walking and Hiking. Plan to walk or hike as a family; in the neighborhood or at a local park. Consider going different places so that it will be something you look forward to. Friday night, when everyone is tired, is a good time to keep it to a short walk in the neighborhood. Keep in mind your fitness level when you plan hikes; once you are fitter you can try longer hikes and trails with major elevation changes. If everyone has a miserable time, you won’t do it again. 2 – Bicycling – Plan a family bicycle ride or join a group ride. Most cities have safe places o ride and offer a variety of group events for riders of different abilities held every weekend. In Tucson, GABA offers many weekend rides and the Rillito River path and the area around Rancho Vistoso are good spots for safe riding. Facebook is also a good place to connect with other families and friends who may want to meet up for weekend activity. 3 – Swimming – Most kids love to swim. Join them in a pool game such as Marco Polo (OK, I know from personal experience this game can eventually drive you nuts), Sharks and Minnows, Tag, Freeze Tag, water volleyball, and water basketball. Everyone will get fresh air and exercise and have fun, too! Your kids will love it that you’re willing to be playful and you might recall just how fun it is to play! 4 – Other sports and games. When I was young (yes I was, once), I used to spend most of my free time outside playing football, volleyball, soccer, whiffle ball, tag, kick the can, ghost in the graveyard. Head to your backyard or the local park and get a game going. It will be a blast. If your family is invited to a party where games are being played, get off the sidelines (and away from the food) and get involved. There are often sports leagues in different cities where you and your entire family can participate. 5 – Chores. The dreaded word. Yet when we garden, clean, paint and do other household duties, we are using our muscles in a productive way that makes us healthier. When you assign work to your children (especially if they do projects with you or each other), they learn to work with others as a team. And it really can be fun. A little water fight after ridding a garden of weeds never hurt anyone and gets the heart rate up every time! 6 – Volunteer. Help with a neighborhood litter clean up or to take disadvantaged youth shopping. When you do something together as a family that enables you to communicate (which TV doesn’t allow), your time together will be more enjoyable. Maybe you want to consider having a technology free day; requesting that your kids leave the TV and computers off for an entire day. Its amazing what can happen. I’ve done this and had my kids say they never knew they could have so much fun outside. In reality, the world outside has far more to offer to our bodies and our minds than a digital screen.